This evening I decided to make "breakfast for dinner." I had a large bowl of fresh ripe multi-colored tomatoes on the counter that need to be used so I decided to make a Tomato Ricotta Frittata (try to say that out loud 3 times quickly...LOL). I kept it simple. I considered adding fresh basil but decided to keep it more mild and used green spring onions (scallions) instead. It turned out delicious. I beat ricotta and Parmesan into the eggs and then topped it with additional small dollops of ricotta. The combination of flavors from the fresh tomatoes, scallions, and cheeses went nicely together. To go with our frittata, I made Parmesan Biscuits which turned out amazing (I'll post the recipe for the biscuits tomorrow). I also browned some turkey sausage links to go with our meal. We really enjoyed our Italian themed "breakfast for dinner" this evening. 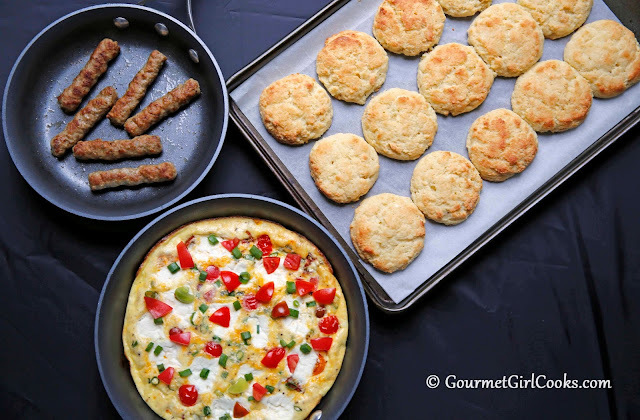 I posted the recipe for the Tomato Ricotta Frittata below (the biscuit recipe is coming tomorrow). I snapped a few photos below. Enjoy! In a large bowl, beat eggs, 1/4 cup ricotta, Parmesan, salt and pepper together until smooth. Heat butter in an ovenproof 10-inch nonstick skillet. Add tomatoes and onions and saute for 3 to 4 minutes until slightly softened. Pour egg mixture over top and cook on top of stove for about 5 minutes over medium high heat. 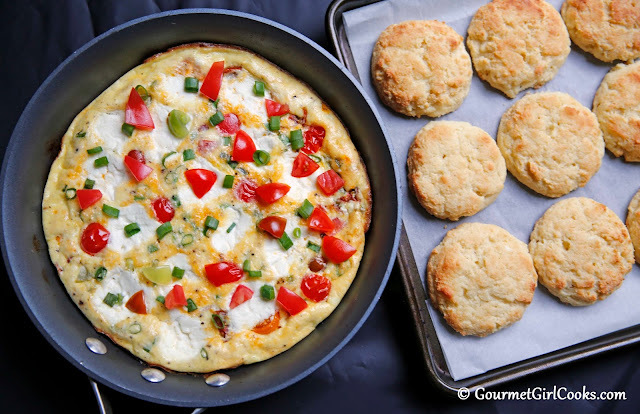 Drop remaining ricotta by teaspoon sized dollops over top of frittata. Bake for approximately 20 minutes or until puffed up and done (no jiggling in the center when shaken). Cool slightly, about 5 minutes in pan; slide onto cutting board and cut into wedges to serve. The Fritatta King at my house is gonna love this ... me too!